Visalaksha lived in Vishnupuram village, years ago. Suffering from acute poverty and none to support him he was disgusted with life and became a sage. Turning a sage Visalaksha roamed all over the country visiting holy places visiting learned persons. In this process, he became a wise and much learned man himself. He felt that his knowledge about the divine path should be helpful to his village people where he originated from and returned to Vishnupuram. The villagers welcomed Visalaksha recognising him to transform as a saint, though he had spent some time of his life in the village as a non-entity. They started addressing him as Chidananda Swamy. Swamy started discourses in the evening timings at the centre of the village. People gradually started getting attracted towards Swamy and his discourses. The style and system of explaining things to people during his speeches drew more and more people not only from that village but also from the neighbouring villages. Taking birth in human form is the biggest blessing to any living being. After suffering for many births and deaths, the soul takes the shape of human depending on the previous deeds. It is this form in which, the soul can attempt to get closer to the Almighty or Creator. Salvation is achievable only through humans by dedicating much of the human time in service and praise of God. People took his message to their hearts and brains and started treating him to be Guru Swamy. Until the entry of Swamy, Vishnupuram was recorded to be one of the highest agricultural produce-yielding villages in the kingdom. When people started devoting almost all of their time for prayers and concentration on salvation and God, the fields and crops were neglected badly resulting in steep drop in agricultural output. Vidyadhara, an educated person was living in Vishnupuram too. He disliked the way villagers were going mad behind Swamy's discourses and devoting most of their time praying God, totally neglecting farming and producing. Recognising the eye of the storm, he approached Swamy, Swamy! It was good you are making people think about God and the divine path. However, people taking your words are neglecting their duties and are going lazy. The situation is that they are unable to produce at least the minimum quantity from the fields. I request you to teach them about the worldly duties besides celestial. Look Child! I am destined to spread the holy matter to all of you. I do not think I am wrong in telling them to concentrate on God. I addressed them to limit their wishes and take out time from daily routine to pray God for his mercy and bestow salvation. Vidyadhara understood clearly that there was no use in speaking with Swamy in this regard. He walked away and thought to make a comprehensive plan to eradicate this problem. He wished to use a finer strategy and met Chandrasekhara, a friend in the neighbouring village to discuss. Vidyadhara asked Chandrasekhara to invite Swamy for discourses in his village. He accompanied Vidyadhara to Vishnupuram and requested Swamy to deliver speeches in his village and Swamy readily accepted the invitation. The next day he went off to the neighbouring village. Once Swamy left the village, Vidyadhara implemented second phase of his plan. He went to the house of farmer Rajagopal, a friend in the village. Convincing him with great difficulty, he explained what is to be done. With the day break there was big crowd in front of the Lord Shiva temple of the village. Rajagopal was vibrantly shaking and making distinctive sounds standing in front of the temple. ooooohhhhhhhuuuu! Haaahhhehha! People started thinking that he invoked God into him and by then he started speaking in a loud tone. Oooohhhhhuuuu! Haaaahhheahhha! All you villagers listen to me carefully! I am Kala Bhairava. I have mercy on your village. I have a message for you people. Lord Parameshwara will come to the threshold of the person who produces the highest yield from their fields in this village. He appears before the person and takes alms from the household and grants boon. 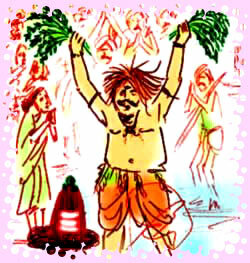 All the farmers of the village unanimously cried promising him, Salutations to You! We all will follow your order. The villagers offered him prayers and Harathi after which he fell unconscious. Watching all this from a distance, Vidyadhara with great difficulty stopped himself from exploding his laughter out. The news spread like wildfire and all the villagers gathered at the temple to see the miracle. Ramulaiah recognising the bag, explained the villagers what happened the previous day and told them, it was the same bag that he gave to the Jangamadevara. People appreciating his luck praised the Lord Shiva for his mercy over the village. That means! The Jangamadevara who visited Ramulaiah's house was none other than the Lord Shiva. Hence, the message of Kala Bhairava became true. From now onwards, Lord Shiva will give Darshan to the farmer who achieves more yield and bless him, Vidyadhara entered the scene and addressed the people. All the gathering agreed and nodded to his words. After some days Swamy returned to the village after touring the nearby villages and giving them discourses. As usual the same evening he went to the speech dais and started waiting for people to gather to deliver speech. To all his dismay, none turned their heels towards him. Everyone was throwing a salutation from a distance and was concentrating with his or her work. After waiting for sometime, Swamy called a passer by and enquired what was happening. He explained the entire episode of Kala Bhairava and Lord Shiva. Swamy was surprised to hear all this. At the same time Vidyadhara reached him and greeted him, Swamy! At least now will you consider that Lord Shiva's utterance Work is Worship is far greater than praying him without doing the assigned duties? Swamy replied, Yes. I do agree. Everyone of us should follow Lord Shiva's orders. All these days I had a myth in my mind that I belonged to this village. Today I knew what should be done. I will spend of the rest of my life visiting holy places and started leaving. Vidyadhara stopped Swamy and requested him to stay back, Swamy! Please stop. You are a learned man. Lord Shiva's orders should be obeyed by you too. You originate from this village and have some responsibilities towards the village and villagers. You spend your life here teaching the children about all the issues that are needed to become a good person in life. Vidyadhara! Swamy replied, though you are younger to me, you made me open my blind eyes today. Yes go ahead. I will teach children and spend my life here, make the arrangements. Vidyadhara taking the help from villagers constructed a Ashram on the outskirts of the village and made arrangements needed for Swamy to teach children. Bhethala said, Hey King Vikramarka! Swamy sidetracked the villagers with his knowledge and to some extent spoilt them. When he realised the mistake, Vidyadhara who corrected him did not allow him to leave. Moreover, he provided a permanent shelter on the village outskirts to Swamy in the name of education to children. Why did he do so? Was that a repentance action for the drama he guided? or is that for the respect within him towards the Swamy? If you do not answer, knowing it your head will blow off to a thousand pieces. Vikramarka told Bhethala, Vidyadhara punished and uplifted Swamy at the same time. Swamy was having a soft corner that Vishnupuram was his village. Hence, knowingly or unknowingly with his knowledge he was responsible for the villagers to go lazy and the drop in agricultural produce. If he left the village, some other place Swamy will be regarded with high respect. The punishment was that dropping him from the position of Guru Swamy to the entire villagers to a meagre level of teacher to children. And, at the same time when it is compared to his life style, it was for Swamy's betterment to turn as a teacher. Here one should remember that Visalaksha turned into Swamy as he was unable to come out of troubles in the same village.